Aladin Gourd | Henry Field's Seed & Nursery Co.
Crafters and decorators alike love this festive little gourd! Aladin vines are a snap to grow—and very productive, bearing lots of 4-5 in., turban-shaped mini gourds in a range of vibrant fall colors. 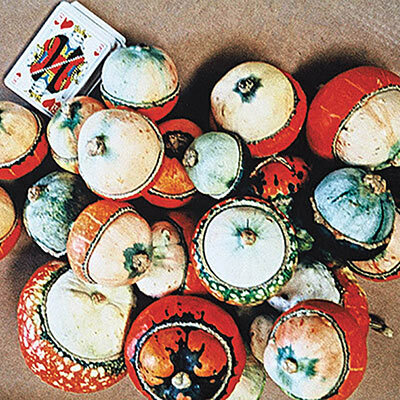 Growing to about the size of a deck of playing cards, these gourds have hard, durable shells that are ideal for decorating. Start seeds indoors about three weeks before transplanting outdoors. You can also sow seeds directly into the garden after the danger of frost has passed. Vines grow to about 10-12 ft. long. 79 DAYS. For each offer ordered, get approx. 20 seeds per packet. Soil Requirements: Rich, well-drained, sandy loam soil. pH 7.0-7.8. Seed Count: Approximately 20 seeds per packet.